Ocean View Condo! Perfect for Families/Golfers/Groups! This condo is furnished beautifully with beach style furnishings, comforters and decor. It is equipped with new kitchen appliances and kitchen ware, a wet bar, TVs in all rooms and new deck furniture. Sleeping 13, it is perfect for families, golfers and couples. Two families or three or four couples without children will find this the ideal vacation rental. Our ocean view is unmatched by any other Islander Resort Villa. Just a short stroll and you are on the wide, flat beach, tennis courts or at the beach club with it's oceanside pool, hot tub, kiddie pool, tiki bar and restaurant. Also on the island are mini golf, Community Center with daily children's activities, wave runner rentals, arcades and several restaurants. Rent a golf cart for your stay and cruise the island: shopping, arcades, mini golf, coastal museum, ice cream shoppe and restaurants are all within reach. Within a short driving distance you will find over 30 premier golf courses, fishing, mainland restaurants, Wilmington and N. Myrtle Beach. After a day of fun, activities or just plain lounging, enjoy the amazing views from our 3rd story deck. Golf details: With over 150 beautiful golf courses within a short drive, OIB vacationers are never far from a round of golf either before or after some time on the beach. We have information about golf packages and can steer you in the right direction to help make your dream golf vacation come true. We are a family of four, who are active and enjoy the beach. We chose this condo over others available at the time of purchase because it has the best ocean view of all of the Islander Resort condos. It is on the 3rd floor so we can see the ocean, the causeway and the island from our windows and the deck. 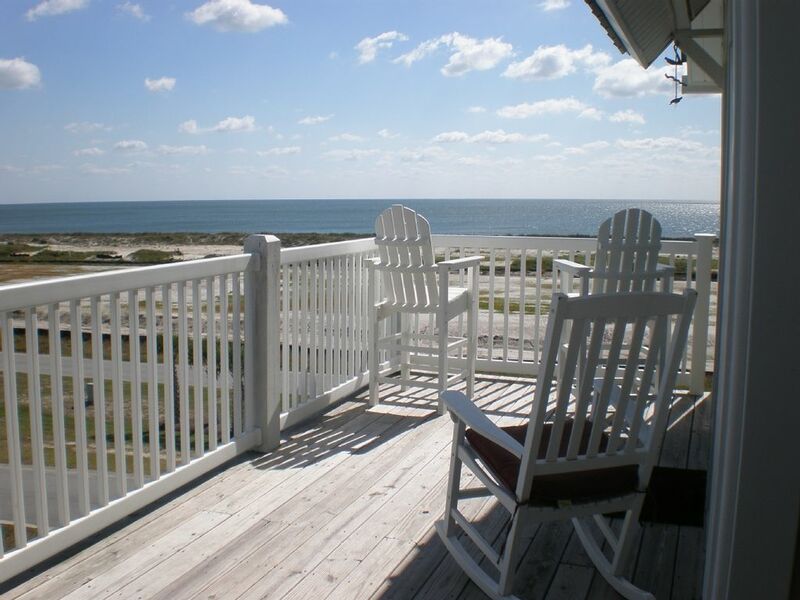 We chose Ocean Isle Beach because it is family friendly with just the right mix of action and quiet. We love the short walk to the beach and the membership at the Islander Resort Beach Club with it's pool, hot tub, kiddie pool, tiki bar and restaurant. It's truly a vacation when you have easy access to good food and cold drinks and you can go back and forth from the pool to the beach as many times as you like. Just a 3 minute walk to the flat beach. The ocean waves are gentle and the water is warm for kids and adults to enjoy from April through November. Our condo community includes 4 tennis courts, oceanfront beach club with pool, hot tub, kiddie pool, tiki bar, restaurant and restrooms. Our view is unmatched in the Islander Villas. See our photos to check it out! Outdoor dining on the deck has seating for 6. 4 hardcourt courts are just 1 minute walk away. more than 50 golf courses within 30 minutes of condo. MBR#1: 1 king, MBR#2: 1 king, BR#3: 1 queen and 1 twin, BR#4: 2 doubles, LR: 1 queen sleeper. Elevator, whirlpool tub, ceiling fans, bathroom in each bedroom, beach club, kiddie pool, tiki bar & restaurant, covered parking, deck with unblocked ocean views, deck furniture includes Adirondack style bar stools and bar height dining table with chairs, beach style furnishings, outside shower, beach gear and charcoal grill. Had a great time! Neat and clean and a well stocked kitchen! Great views. Would stay there again and highly recommend it. Oh my goodness the view! I am still missing it. Wonderful clean condo! Exactly as pictures show. Thank you for a wonderful vacation. Our family enjoyed the condo and it was plenty large enough for all of us! The kitchen was well stocked with pots/pans etc. It was fantastic to have the 4 bathrooms too! The view from the deck was spectacular, and the tall furniture was comfortable. The only "problem" was the cable was out due to previous storms, but there was Netflix, so not a biggie. The beach equipment in the closet was outstanding - we wouldn't have needed to pack our chairs, umbrellas or toys had we known how great everything was in there!! Overall, we loved it, and would love to come back!! The views off the deck are great. The actual living space is very nice. The kitchen was well equipped . The living room furniture was worn ,broken and shabby. Carpets very stained. Broken drawers in the fridge , held together with tape. There was a leak in the living room near the door that was taped with the same white tape as the fridge. We had quite a bit of rain and the tape was not adequate to stop the rain from making the carpet wet. A very bad musty smell came from the one king bedroom. Every light in the condo was no more than 12 - 15 inches high , so you could not read.They looked like children's room lights, some did not work. Two of the tv's did not work and one did not have a remote. The grill was a small dollar store variety that is not conducive to grilling for a family. All of the furniture could use a fresh coat of paint and some TLC. I realize people don't treat vacation homes well and some wear is expected but I was fooled by the glowing reviews about this property. This is my third rental from Homeaway , both of the other two had truthful reviews. This one did not. I would much rather pay a few hundred dollars more for better furnishings, cleaned carpets and an updated look. It's a shame because the property itself could be a show stopper because the views and beautiful light of the living space. Afraid to trust Homeway reviews again. We are very responsive to any issues brought to our attention by our renters. The musty smell, caused by the humidity each summer, has already been addressed by cleaning out the A/C unit. The door leak due to large amounts of rain this summer will be fixed immediately. We've had off and on cable TV issues this summer, again due to the many storms. Our carpets were professionally cleaned this spring. When renters contact us during their stay, we do our very best to immediately fix any problems that they have encountered, as we have a local handyman and a cleaning crew available to come in if necessary. All reviews are completed by actual renters, per HomeAway and VRBO policy. We had such a nice time. Loved that big open porch. Condo very nice. The pool was nice with the outside tiki bar but would of preferred it to be closer. You have a short walk to the Ocean which was great. We will definitely come back next year! Great vacation property and family friendly. So many amenities at your fingertips. Beach toys, wagon and chairs in lieu of having to pack and travel with extra load from home. Owner very responsive to questions and followup and great to work with. Highly recommend! Ocean Isle Beach is a beautiful barrier island near the southern most point of North Carolina. This location provides OIB with very warm ocean water temperatures May through October. Mild winters make OIB a year round destination for golfing, shopping and relaxing. The beach is wide and flat. It's perfect for kids to run in the waves, build sand castles and have an Italian ice from the ice cream cart. Adults will find plenty of room for bocce ball, volleyball and games of 'golf' as well. OIB is a quiet community appealing to families and couples, but it is very close to North Myrtle Beach for large amusements, dining and shopping. Just off the island are many quaint shops, smaller amusements, a cinema and a variety of dining options. Calabash is known for it's seafood restaurants and is just 10 minutes away. OIB has plenty to do without feeling overcrowded. Golf: Golfers will love our 4BR/4BA floorplan and our close proximity to premier golfing. Over 30 courses are located in Brunswick County and all are within 20 minutes of the condo. Nearly 1/3 of Mytle Beach's 'Strand' courses are actually located here! Why stay in a cramped hotel room, when a new, clean and spacious condo for 13 can be just as affordable? Call/email for more info about golf. All week long summer rentals include a $100 gift card to a local restaurant. All week long non summer rentals include a $50 VISA gift card. All rentals include use of bed linens and bath/beach towels. All week long rentals include linen laundry fee. All non week rentals may choose to launder linens themselves (no fee) or pay $50 for this service. All rentals of 2 or more days include the cleaning fee. Those that are 1 day add $100 for cleaning.